Brandon Mathis has been freelance writing since 2007, covering health, mountain sports, lifestyle and travel. His work has appeared in "The Mountain Gazette," "The Durango Telegraph," "Inside/Outside Southwest Magazine," "Climbing Magazine" and more. With a Bachelor of Arts in humanities, he has a background in archeology, the winter sports industry and photography. Rock climbing seemingly draws on every kind of movement the human body is capable of, and requires strength, fitness, flexibility and endurance. 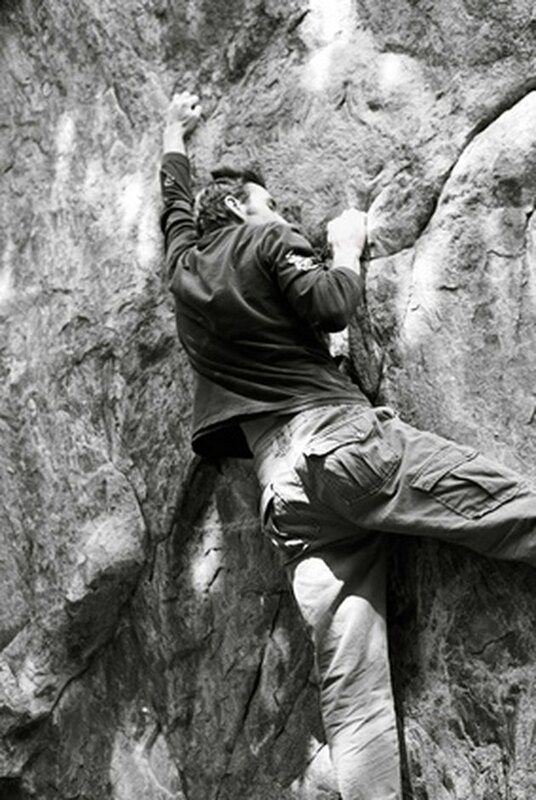 While strong fingers, arms and shoulders are needed for pulling on hand holds, proper, efficient footwork is also crucial to competent climbing. Its no wonder that training for such an activity can be difficult, as climbing incorporates the entire body. However, certain types of training and a few basic exercises have been shown to make a significant difference in climber's endurance off the ground. The pull-up is an obvious exercise that works the arms, shoulders and back. Many climbers use mounted hang boards, specially made boards with finger and hand holds that mimic natural features on rock, to perform these exercises. The pull-up is also highly overlooked as a hand and grip exercise as well as a core exercise. Finger and grip strength is one of the first things to go in a climber's reserve, so regular pull-up training greatly improves this weakness. The dead hang is the un-exercise. Simply grab a pull up bar or hang board, lift yourself just off the ground and hold on for as long as you can. This trains the muscles in your fingers, arms, shoulders, back and core to maintain the level of strength to hold you up in a scenario where your feet are not secure, a circumstance often encountered in climbing. According to IndoorClimbing.com, your grip strength is a result of all of your forearm muscles working together when needed. Forearm endurance is a foundation of climbing strength. Speed climbing is a fun way to improve climbing endurance and teach your body to become more efficient. At the local climbing gym or at your favorite boulder or climbing crag, find a moderate route that you can climb easily and try climbing it as fast as possible. According to the University of Oregon, speed climbing builds muscle memory and teaches you to move quickly through tough spots and not waste energy. Experienced climbers know not to expend energy in awkward positions, but look for places to rest where they can relieve certain muscles. When speed climbing, avoid stopping until you have completed the climb. Climbing requires strength, but is also requires grace and agility. Much of that is learned through experience, but it helps to practice slow, static movements from the beginning. If you're training for a specific route, its important to build the strength necessary to do it, but don't spend too much time on it, isolating only those muscles used. Try stepping away from it and working other challenges. The varied training may help you reach your goals. Regular and continuous climbing will help boost endurance when it counts. Find warm-up routes or long moderate bouldering problems well within your ability and practice efficiency and fluid movement. The repetitive low stress gripping will develop endurance. Try warming up and down with several laps. According to the University of Oregon's Physical Education and Recreation website, you build significant endurance by training on routes that are not as tiring. What Muscles Are Used in Climbing Ropes?